I was touched to tears and so was my darling friend Chantal who mentioned that it was a hard choice as all the stories were sooooo wonderful!!! Wearing Naomi Assenheim’s jewelry causes me to reflect on connections. Connection to ancientness and mysteries. The stones that the earth creates are both mysterious and wondrous to me. Naomi is a gift on this earth, a creative soul who discovers and responds to it’s natural beauty, embellishes it and manifests a piece of art to adorn the next spirit who connects through it. Certain pieces speak to me, I know when I connect with one. I may attempt to describe what it is that attracts my senses but it’s really beyond words. It’s a deep intuitive feeling that resonates. I wear a piece that Naomi titled ‘Abundance’ from her Branching Out Series. It reminds me to be grateful for the abundance in my life. It’s a touchstone at my throat that reminds me of what it is that I am rooted in. Living in a large city, I need to feel connected to the natural world, wearing her jewelry helps me express the part of myself that is deeply connected with nature. Friends, associates and strangers frequently comment on it or even reach out to touch it. I know then that a connection through the significant power of the piece has connected me with someone else for a moment as they reverently respond to it’s beauty. That in itself is divine. I am blessed to have connected with Naomi. Her work embodies spirit that fills me with awe, wonder and appreciation on many levels. I have several of your pieces of jewellery and enjoy them for their beautiful design and exquisite craftsmanship. But there is one piece that means more to me. I stopped by your booth at the farmers market this past summer and was drawn to a plume agate pendant. The stone was simply set in a twisted wire setting, but it was the image of a tree bursting from the stone that drew me to it. Two years ago my mother, my last parent, passed from my life. Although in many ways it was a release for her from the confines of an aged body and illness, I continue to grieve with my loss. Whenever I would begin to feel overwhelmed, I would find a place where I could take a breath and release the grief and the negative energy...in a garden or park, surrounded by nature. Finding the pendant with its inherent tree on that day was timely, as I had been sorting through some of her possessions that morning. Some things I was able to let go of, others found a more permanent home...all bringing up both good and bittersweet emotions. Wearing the pendant is a catharsis, a constant reminder to look up, to celebrate life my mother?s life as well as my own. I have always treasured my Opal Wing creations. Each piece I have chosen speaks to a different part of my personality and I wear each with great delight. This year, I asked Naomi to help me create two pendants -each representing one of my beautiful children. The results were nothing short of magical; the pieces I received seemed to speak directly to my soul. It was important to me that both pendants not only reflect my children as individuals but our own unique relationship as well. 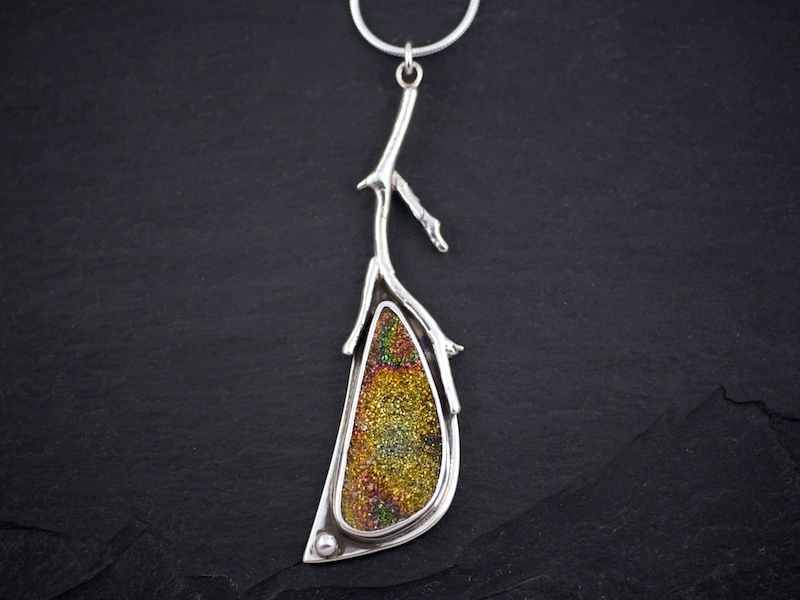 My daughter's pendant echoes her creative, fluid, open temperament and her pure, bright soul. She is my cohort in all things- we share so much in common and are each other's truest friend. My son's piece is reveals his grounded, self-assured nature and our deep connection and attachment to one another. There is something magical- ethereal even, about wearing these deeply personal ornaments. They evoke within me the calm peacefulness of a mother being together with her child. My children are reminders of my purpose, my goals and are my greatest joy. On days I feel things moving too fast or life swirling around me, I choose these pendants feel centered, focused and whole. As they grow, I know my children will come to cherish these pieces as I do. Every time my daughter looks for hers in my jewellery box, every time my son fiddles with his absent-mindedly while nursing, I am reminded that to them, they are a piece of me to be adored. Sarah Bohan and Ashley Ruiz!!! We are not finished yet!!!! I am going to post all the stories from 1-9 and I need you to vote for a people's choice... If you feel that your story is deserving, feel free to vote for your own!!! The winner of this award will receive a Gift Basket from me of all sorts of delicious and wonderful items!!!! Please just comment on the post or drop me an e-mail with the story that you believe to be your favourite!!! Three pieces of iron stained chert sit atop a fireplace mantle largely ignored for 30 years. Hewn from hard, silica-rich microcrystalline rock into deadly points more than 3,200 years ago by hands unknown, the spearheads lay like diamonds in the rough. Implements necessary for survival utilized by the First Nation people from Southern Ontario in 1,200 B.C. before bow and arrow capability, the red patina, conchoidal fractured pieces beg for rebirth. 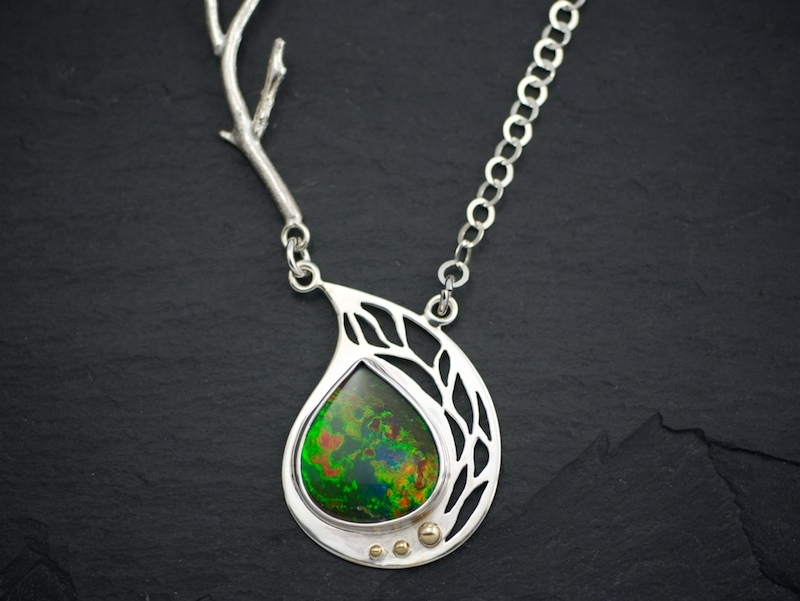 Delivered into hands of Opal Wing Creations, the elegant spear points are reborn thousands of years later as pendants, enhanced with a Yowah fire opal with clever silver wire settings in the same way the points would have been attached to a wooden shaft. Yesterday's forgotten tools have been transformed into heritage gems to be loved and appreciated. Today the pendants are worn as necklaces, enjoyed by three sisters, who like the spearheads, are born of the same DNA material but are different in shape and character. And like the spearheads, although the sisters are separated by an ocean and countries from each other and their place of birth, they are united by their handsome, unique and distinctly Canadian Opal Wing artistry. Buying jewellery, and I’m thinking in particular of Naomi’s wonderful works of art, can be compared to choosing a new puppy to join your family. When shopping for a puppy, you visit the breeder and all the litter mates come bounding over to inspect you. But one little bundle of fur, maybe not the prettiest nor the color you were intending, keeps coming back and nuzzling at your hands until he finds a place in your heart, and in essence he has chosen you rather than the other way around. Similarly, when entering Naomi’s little display area, one semi-precious stone loudly calls out to you “I’m yours”! Naturally you don’t immediately buy the first article you pick up, but enjoy trying on the other works of art that attract you. But inevitably, you will return to that first piece and that is the one you will buy. Is it the colour of the stone, or is it the setting that attracts you or is there some magic in the stone that meets a need in your personality? Our native people believed that there were spirits in inanimate objects and maybe with civilization we have lost this mystical awareness but it still persists. And just as puppies have differing personalities as they fill a space in our family, so too do the stones fill a niche in our hearts giving us our own unique sense of style. A Heart on Fire The act of buying a true gift, the kind from the heart that one hopes that the person receiving the gift will treasure, as a reminder of that love, is an art. Buying our mother’s Christmas gift is an annual challenge that my fellow conspirators look forward to each year with the hope of finding the perfect special thing that will make my mothers face light up with joy because we’ve surprised her with a gift that speaks to her of how much we love her. Now my mother would love anything we got her really, as she just that sort of mother who manages to love her often scattered, geeky, disorganized and messy children just as we are and I’ve never known her to be disappointed in a gift from us. Most years we do a good job of finding something just right, but occasionally an opportunity to really practice the art of true gift giving comes along. This story starts off with my mother carelessly introducing me to a particularly fascinating Mexican Fire Opal on a routine mother-daughter jaunt to Glen Williams. My mother had fallen in so in love with the stone that she had to visit it while waiting to see what Naomi would do with it. She’d already asked that the piece with this opal be reserved for her. On a cold November day, the call from Naomi finally came to say that this special piece was ready. However, my parents were away, and it was I who intercepted the call from Naomi. In one of those rare flashes of genius, I realized that the perfect opportunity had tumbled into my lap. Thus, I quickly convinced Naomi to join a wonderfully subversive conspiracy to surprise my mother with the piece, Heart On Fire, from her children and husband with love on Christmas morning. The plan was simple, Naomi was away at a show that weekend, but her mother was minding the shop in Glen Williams – her mother would “accidentally” sell the piece that was supposed to be reserved for my mom to someone who came to the shop and then Naomi would apologize to my mom when she “found out” that the piece had been sold and all of us would neglect to mention to my mother just who the buyers happened to be. The plot set, I jumped into my car with my brother, both of us excited with the brilliance of the scheme, and raced to Glen Williams to purchase the gift, just a little bit worried that we might run into my parents there already. We finalized the details of the plan with Naomi’s mom, advising her to play dumb should my parents show up. When my mom did find out about the piece being sold, she was indeed disappointed, but tried not to show it too much. Then, we commenced the long wait until Christmas morning, hoping that our secret wouldn’t accidentally be revealed or that we’d give ourselves away. Christmas is very much about family and we all have to wait until everyone is there before opening presents. The first hurdle was getting my parents up following the rules that they may only be woken at 7 am if we come bearing coffee and cookies. However, this was an extra special Christmas because it was the first time that me and all 3 of my brothers were home for Christmas since one of my brother’s moved west. The extra guests including baby Jack meant that we not only had to wait for my parents to get up, but then wait for everyone else to get there. My mother could tell that we were anxious about giving her gift, but we were adamant that we waited for everyone to be together. The baby insisted on crying and making everyone late until I thought I would go crazy if I had to wait any longer after a month of squirreling away the gift in a secret hiding place. The wait was worth it as my mom as my Mom was finally able to open her gift. Just as we’d all hoped, she was truly delighted by the gift and absolutely surprised. My mother claims that there are so many things that make it special. The stone and the Naomi’s art of making it into more than just a stone, the surprise and the intrigue and story behind it, but most of all she says its special because it came from all of the people that she loves and that we got together to make it special for her. I don’t think that it hurts that it is heart shaped – a gift of a heart to a woman with a big and loving heart especially for all of us. She says she still thinks of us and that morning every time she wears it and we are still grateful for Naomi’s willingness to aid us in giving one of those perfect, special, once-in-a-lifetime gifts. Creative Conduits Wearing Naomi Assenheim’s jewelry causes me to reflect on connections. Connection to ancientness and mysteries. The stones that the earth creates are both mysterious and wondrous to me. Naomi is a gift on this earth, a creative soul who discovers and responds to it’s natural beauty, embellishes it and manifests a piece of art to adorn the next spirit who connects through it. Certain pieces speak to me, I know when I connect with one. I may attempt to describe what it is that attracts my senses but it’s really beyond words. It’s a deep intuitive feeling that resonates. I wear a piece that Naomi titled ‘Abundance’ from her Branching Out Series. It reminds me to be grateful for the abundance in my life. It’s a touchstone at my throat that reminds me of what it is that I am rooted in. Living in a large city, I need to feel connected to the natural world, wearing her jewelry helps me express the part of myself that is deeply connected with nature. Friends, associates and strangers frequently comment on it or even reach out to touch it. I know then that a connection through the significant power of the piece has connected me with someone else for a moment as they reverently respond to it’s beauty. That in itself is divine. I am blessed to have connected with Naomi. Her work embodies spirit that fills me with awe, wonder and appreciation on many levels. I have found Naomi working at this teensy weensy back room at the mill,and I was captivated. Now after a great explosion, her work has evolved to infinite beauty and workmanship. I always get compliments whenever I wear her creations. I love to show off any new purchase. 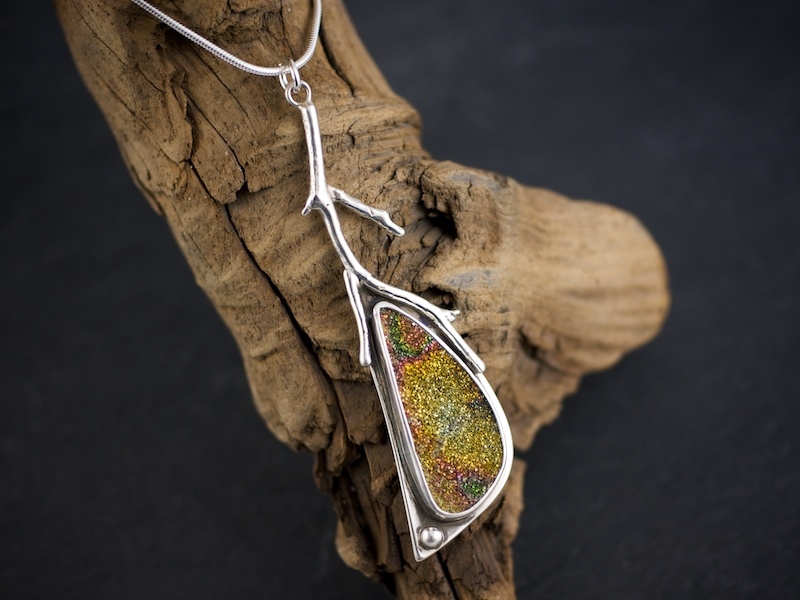 However one of my fav ones is an ammolite pendant.,made a couple of years ago. Fell in love with it and was mesmerized with the discovery of this stone,a kaleidoscope of colors. This is what I want to convey . Naomi's love and knowledge of stones has made her work so special .and unique.,definitely. ONE OF A KIND. Opalwing creations has changed the way I feel about my connection to how I adorn myself; my connection to the stones and stories that come with each piece of jewerly one wears. The Fairy ring was the first piece I ever purchased from Opal Wing Creations, Naomi's warm and loving spirit came through in the piece and when I opened it and put it on my finger, it felt like *home. * I began encouraging everyone I knew to look at her pieces, to read her story on her website and to connect to not what she was selling, but what she was *saying. * Her pieces speak to a time of more wisdom, of slowing down, of encouraging the shy soul to express themselves with a little help from the stones nature gives. I knew my mother should have a fairy ring of her own. I love my mother more than life itself, her kindness and grace have moved my childhood through many precious moments. My father and I spoke and soon we were having Naomi make a fairy ring for my mother's birthday. When we presented my mother with Naomi's creation of a sky and earth opal fairy ring, it was a beautiful moment. I felt so blessed that my wonderful mother would have her very own connection to the Earth in the form of this beautiful adornment. 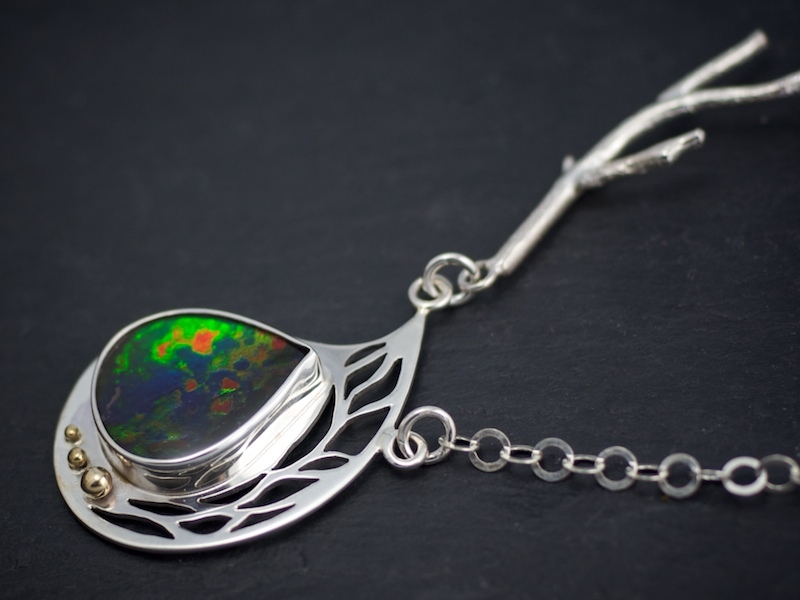 I have always treasured my Opal Wing creations. Each piece I have chosen speaks to a different part of my personality and I wear each with great delight. This year, I asked Naomi to help me create two pendants -each representing one of my beautiful children. The results were nothing short of magical; the pieces I received seemed to speak directly to my soul. It was important to me that both pendants not only reflect my children as individuals but our own unique relationship as well. My daughter's pendant echoes her creative, fluid, open temperament and her pure, bright soul. She is my cohort in all things- we share so much in common and are each other's truest friend. My son's piece is reveals his grounded, self-assured nature and our deep connection and attachment to one another. There is something magical- ethereal even, about wearing these deeply personal ornaments. They evoke within me the calm peacefulness of a mother being together with her child. My children are reminders of my purpose, my goals and are my greatest joy. On days I feel things moving too fast or life swirling around me, I choose these pendants feel centered, focused and whole. As they grow, I know my children will come to cherish these pieces as I do. Every time my daughter looks for hers in my jewellery box, every time my son fiddles with his absent-mindedly while nursing, I am reminded that to them, they are a piece of me to be adored. Naomi, I thank you from the bottom of my heart for your beautiful gifts. Your pieces are not only works of art, but something much more- they have been life changing wearable reminders of my precious blessings. I have several of your pieces of jewellery and enjoy them for their beautiful design and exquisite craftsmanship. But there is one piece that means more to me. I stopped by your booth at the farmers market this past summer and was drawn to a plume agate pendant. The stone was simply set in a twisted wire setting, but it was the image of a tree bursting from the stone that drew me to it. Two years ago my mother, my last parent, passed from my life. Although in many ways it was a release for her from the confines of an aged body and illness, I continue to grieve with my loss. Whenever I would begin to feel overwhelmed, I would find a place where I could take a breath and release the grief and the negative energy...in a garden or park, surrounded by nature. Finding the pendant with its inherent tree on that day was timely, as I had been sorting through some of her possessions that morning. Some things I was able to let go of, others found a more permanent home...all bringing up both good and bittersweet emotions. Wearing the pendant is a catharsis, a constant reminder to look up, to celebrate life my mother?s life as well as my own. Once a long time ago, there was this little fairy princess with curly hair, a big smile and such a friendly manner. She slipped into my living room behind her mother and with her little brother bouncing along side her. You see as they were good neighbors they wanted to welcome us to the street and the town of Georgetown. I was instantly charmed by them all and my own little Princess Kimberly was smitten by Princess Naomi. A deep friendship started that day, although no one knew at the time where these princesses were going in life. Riding bicycles, sleepovers, birthday parties, school days and even a few princes later they were still good friends. They shared a magic and a history together. Princess Naomi travelled around the globe, always coming back home to regale Princess Kim with stories and pictures of lands far away. Princesses often travel down different paths – they were no different. Sometimes this would make it hard to continue friendships as time would pass them by. Not these two. Somehow we always got word of where Princess Naomi was and what wonders she was up to. She was a free i with a unique energy halo around her. Princess Kim loved the stories and always kept the friendship circle alive and well. The mothers and fathers too kept in touch and always exchanged proud news about their girls as they became well educated young women. New loves were introduced and new ideas. I had helped found the Georgetown Farmers Market and was always on the lookout for new and interesting vendors to share the fun. Princess Naomi was trying out her jewelry making crafts and ideas. She loved being a vendor at the market. Princess Kim was excited and loved seeing her friend’s creations. She wore them with pride. Life kept spinning and Princess Naomi discovered a golden trail of talent in her fingers for beautiful and spiritual pieces to soothe her soul and entice her creativity for her clients. She fell in love with jewelry and it in turn touched her with magic. Everything turned to gold for Princess Naomi in her shop called Opal Wing Creations. She developed into a sensual, beautiful woman and artist. Princess Kim also developed as a sensual and talented artist in her own right. She now ran the Farmers Market as well as her own gourmet cookie business. It was only fitting that these young women found a way to stay friends and encourage each other’s businesses and talents. It is with great pride that the mothers stand back and watch their Princesses giggle and laugh together as long time friends and successful women in their own right. I hope everyone gets a chance to come see and touch the spiritual pieces Naomi creates At the Gala or anytime. On the Gala nights in December there is pixie dust in the air around them as they mingle and talk together. Perhaps you will have a chance to sample a delicious morsel from Princess Kim’s “Lovely Bites” as you find yourself drawn into a piece made by Princess Naomi. Let yourself go where angels fly and time stands still. This is a testament to friendship and talent, given freely with nothing asked and everything given. This is the magic of the holiday season from two very special princesses that I am thrilled to have had the honor of knowing and watching them grow. Come, gather your friends as you fall under the spell of Opal Wing Creations – let the pixie dust fall on you as you laugh for no reason and feel your soul get light. You see, you never know when you will meet a princess and where she will lead you. Enjoy it all, life doesn’t get any better. Thank you all sooo soooo much for your entries, your energy and enthusiasm!!! You have all touched my heart!!!! here are two more pieces for you..... You will find them on ETSY soon!!! !